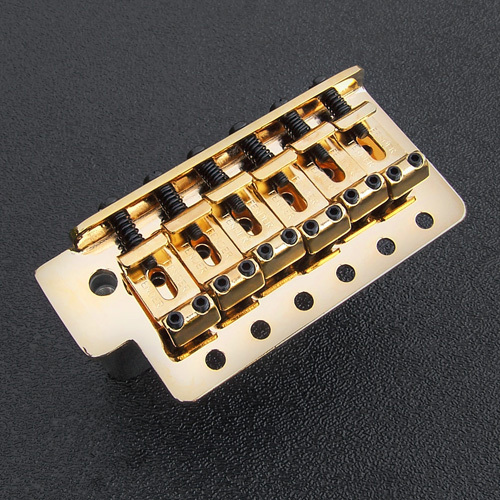 Genuine Fender® Classic Series Strat® vintage style tremolo bridge assembly, Gold. Vintage style bent saddles with "FENDER" stamped in each saddle. Black intonation screws/springs and black saddle height set screws. Fits Strat's with 2-7/32" mounting spacing and 2-7/32" string spring. Full size cast tremolo block. Accepts metric 5mm tremolo arm (not included). This is a right handed bridge assembly.